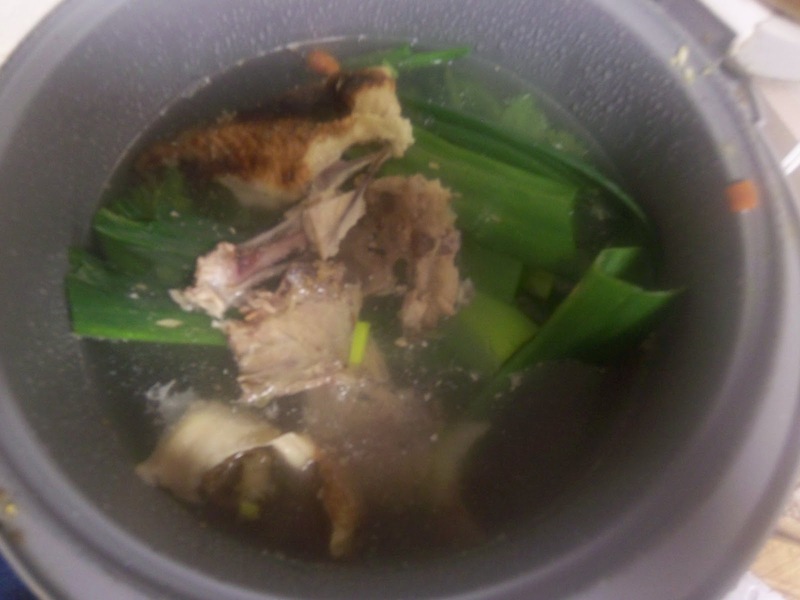 Mandy dosed us with her curing soup, made with carrots, leeks, celery, and hair from a unicorn's tail. It was delicious, but we both hated to see those long yellow-white hairs floating around the vegetables. I've been sick. This soup from Gail Carson Levine's Ella Enchanted was the first thing I thought of. Wouldn't it be lovely to have some unicorn hair soup to make everything better? Soup sounded great anyway. I'm going to admit that the actual vegtables didn't -- I ended up eating broth with just the "unicorn hair," but here's how to make the whole thing. Prep the veggies, reserving the end-bits. 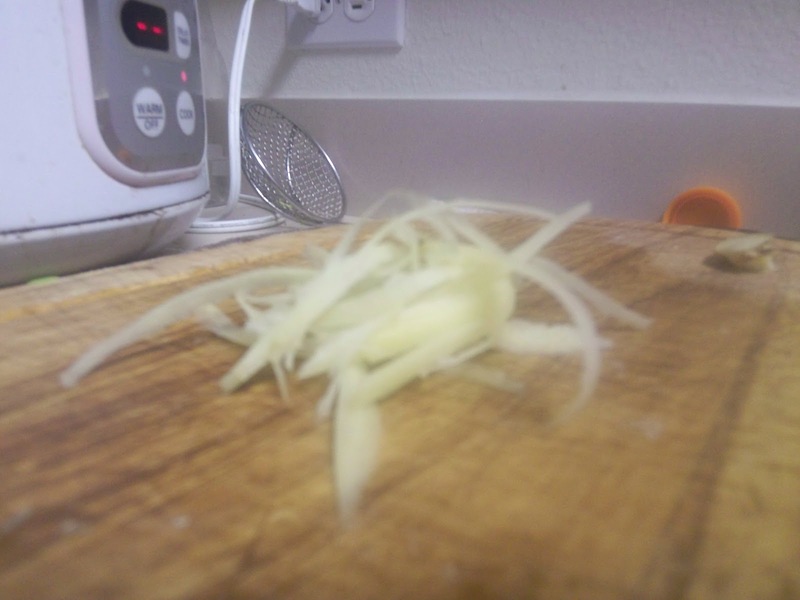 For the leeks, this means taking off the dark green parts, the roots, then splitting the leek down the center, then slicing thinly. Fill a big bowl with cold water and swish these around; leeks inevitably have dirt between the layers. 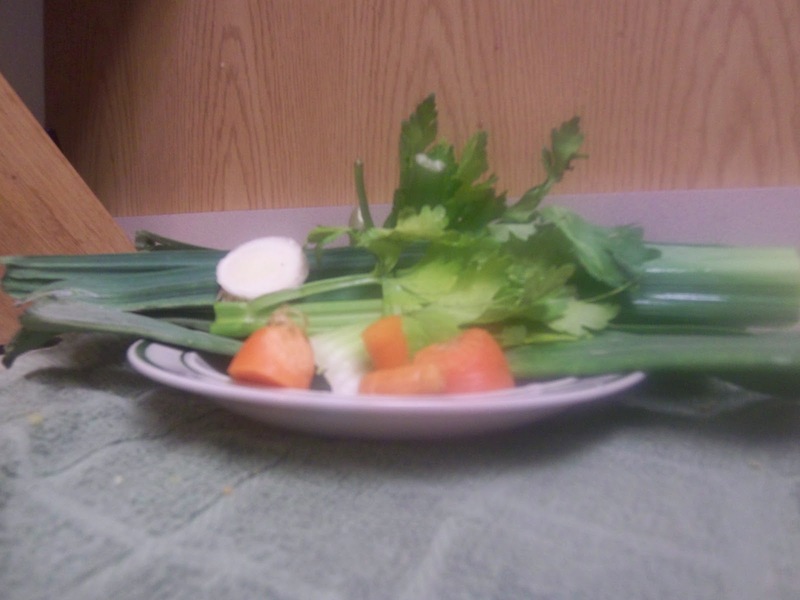 Dice the carrot and celery. Mmm...look at those veggie ends. Toss the veggie ends and the chicken bones into a rice cooker, crock pot, or pot on the stove, then cover with water and simmer away. Taste, season with salt, then strain. Okay, so you could just use store bought chicken stock...but why not make it? It's super-easy, healthy, practically free, and -- most importantly -- tasty. I always keep a baggie in my freezer to stash chicken bones and vegetable trimmings. I just throw everything in my rice cooker and let it go, but you could also make stock by bringing it all to boil on the stove, then reducing to a simmer for a few hours, or letting it go overnight in a crockpot. Taste it. If it's seems bland, add a few pinches of salt. If it tastes watery, let it cook longer and reduce. Add the diced, prepped veggies to the pan with a pinch of salt and cook on medium-low until they soften. 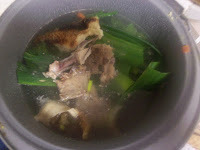 I'm afraid in my eagerness for throat-soothing soup, I skipped this photo. Sorry! Meanwhile, use a peeler to shave thin, long pieces off the ginger. It's the right color, I love to eat it when I'm sick, and in a perfect world, unicorns would taste like ginger. If you really like ginger, peel a lot. If you're wary about it, use less. Slice these thin pieces into "hairs." The thin pieces, taken the long way across the ginger, should be with the grain anyway, so these end up looking quite a bit like hairs (despite my struggling photography). Add the "hairs" and four cups of the broth to the vegetables. Simmer for about ten minutes, or until the ginger softens. 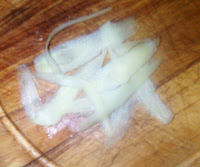 I'm afraid I neglected taking a picture of the end product, but I loved having little ginger hairs in my soup! And then, of course, I tossed the peelings from the brown, outside part of the ginger with a lemon in the rice cooker, and lemon-ginger tea was born. I know. I use my rice cooker for everything. Cool! A real recipe, and small magic. Mandy would be delighted.